Did you know that there is a whole genre of baking with gumdrops? 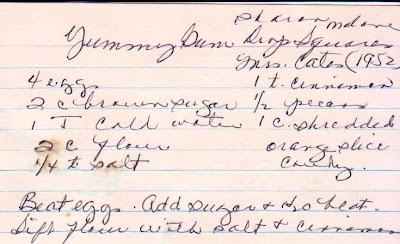 I didn't until I discovered a hand-written 1952 recipe called Yummy Gum Drop Squares, which led to some internet research revealing all manner of cakes, cookies and squares adorned inside and out with gumdrops. These I had to try, for I love candy. Almost as much as DH does. 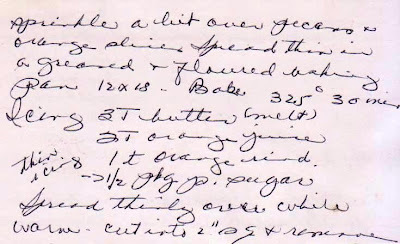 Adding to the appeal is that the recipe card is signed by the collector, a Sharon Malone, and attributed to a Mrs. Cates. 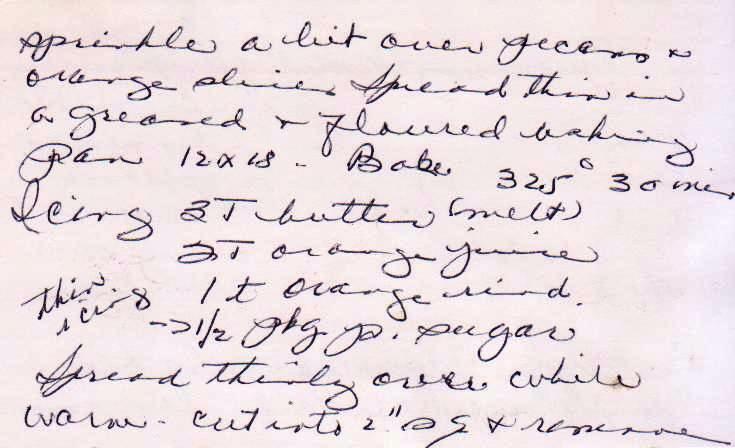 I always think of these recipes as even more valuable, that someone thought enough of it to "claim" ownership. The problem was, I had never even seen the orange slice candy called for in the recipe, so months went by and I just put the recipe aside. And then, one day while visiting my mother-in-law who had just moved to an assisted living facility ("the institution," as she calls it) in New Jersey, I stopped by a 7-Eleven and there, right at the cash register, were bags of orange slice candy! The candy was really good. So good, that I ended up eating too many, that I didn't have enough for the recipe. But I knew that I would return to visit my mother-in-law before long, and was able to get another bag of orange slices. 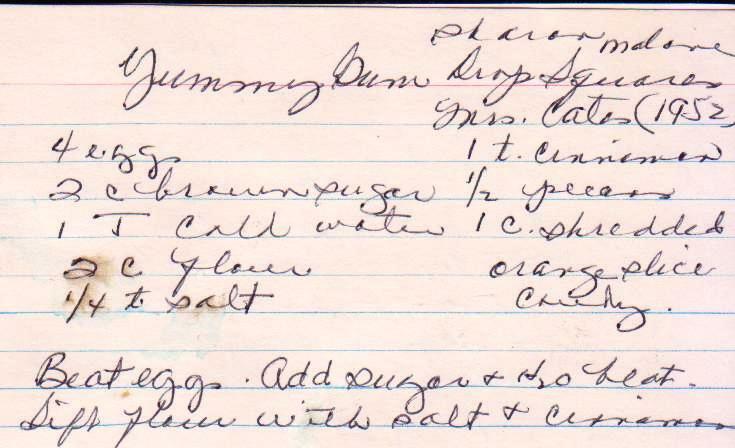 Not surprisingly, this recipe is part of a collection from Texas, where they sure like their sugar. These bars are very sweet, but strangely addicting. While they certainly wouldn't do for a dessert at a dinner party, as an after school snack, they'd be perfect. If you make these, don't do what I did -- try to shred the candy in a food processor. I ended up with one big gummy ball of orange sticky candy. Instead, just slice the candy with a knife. Sometimes the simple, old-fashioned way is best. i like my candy straight -- like a man!! !